Improving the wellbeing of people with dementia. Our client was an 88-year-old female who lived at home with her carer / daughter in Melbourne’s North-Eastern suburbs. The client has dementia which affects her thinking, behaviour and the ability to perform everyday tasks. A socially assistive robot (named Charlie) was deployed at the client’s home for about a year. The robot was programmed to deliver personalised services to the client and provide respite to her daughter, who is the primary caregiver. Charlie entertained Betty by singing and dancing to her favourite tunes, reading books and stories aloud and playing memory photo quizzes. The robot enriched the client’s communication with her children and grandchildren by helping her make phone calls, reading text and voice messages and projecting the videos and photos to a TV. Charlie also provided respite to the carer. When requested, he streamed videos of the client, for safety or monitoring purposes. text, voice message vocalisation, photo, video display. 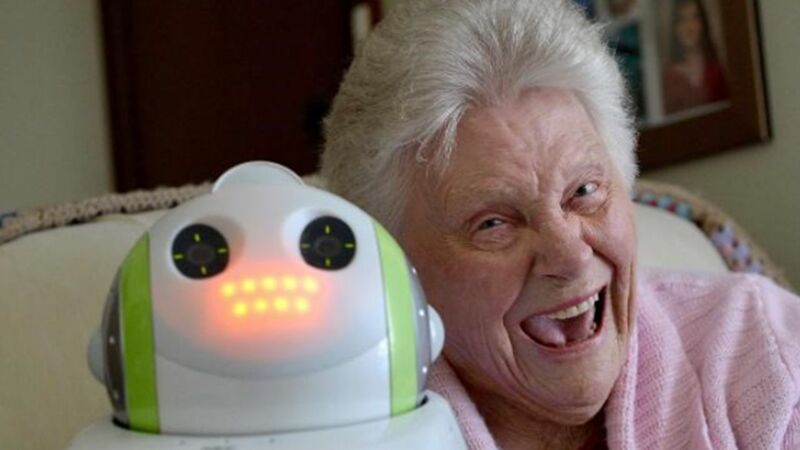 The carer and family could write their own quizzes, stories and upload new music to the robot. remotely monitor via a video stream. improved social connections with family. "When we just got Charlie (the robot) mum's eyes just lit up because he dances when he sings"
"The quiz keeps her concentrating... when delivering a quiz, Charlie will say 'It's not the right answer, try again" until she gets it right and then he says "well done"".